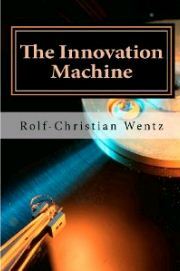 Publications on innovation and innovation management often are only concerned with product innovations, i.e. innovations within the existing business model. This is definitely too short-sighted. As a consequence of ignoring business model innovations, a major source of innovation would not be detected by the company´s radar screen. In the period from 1997 to 2007, 26 companies which were founded since 1984 have entered the American Fortune 500, and more than half of them, i.e. 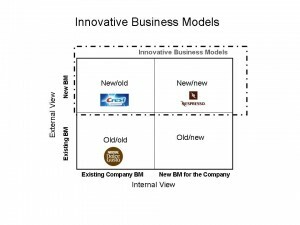 14 companies did so through a business model innovation (Johnson 2010). The meaning that people attribute to the term “business model” varies greatly. Frequently the term business model is used as an equivalent to profit model. But this definition is much too narrow. To explain why, I give you just one example. When Southwest Airlines launched in 1960, it was successful against the established traditional airlines because its innovative business model diverged from that of its competitors in many respects, with differences in the profit or revenue model being only one part. At least as determining for the success of the Southwest Airlines business model was that Southwest Airlines offered its customers major time savings due to its direct point-to-point flights and a much friendlier service, and that Southwest Airlines built excellent relations with its employees which resulted in, for example, outstanding employee productivity which in turn allowed a generous employee compensation. A business model is a description of how a business creates and delivers value, both for the customer and for the company. It is a short-hand description of the business of a company or business unit. The description is at a high level of aggregation and provides a quick “big picture” overview. If we describe the business model of a specific company we focus our description on those components that are the most important for the value creation of the company, and that set the business model apart from the others. As the term indicates, value must and can only be judged from the customer´s or consumer´s perspective. These four main components of a business model can be broken down in sub-components. In the following I use nine sub-components. This way of describing a business model lends itself very well to its practical use (see also Osterwalder, Pigneur 2010), as I will now illustrate by means of the Zara business model:. Often established businesses do not find it easy to describe their business model. But this is the first step needed before a company may start thinking of changing its business model, or about introducing another business model in parallel. The above 4-component/ 9-subcomponent model should facilitate the identification of one´s own business model. 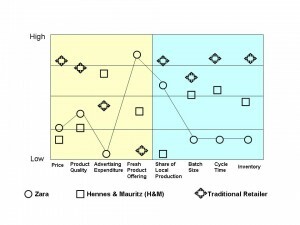 Once this is done, we can also begin checking to what extent our own model differs from that of competition (Kim and Mauborge 2005) as we do here with the Zara business model. 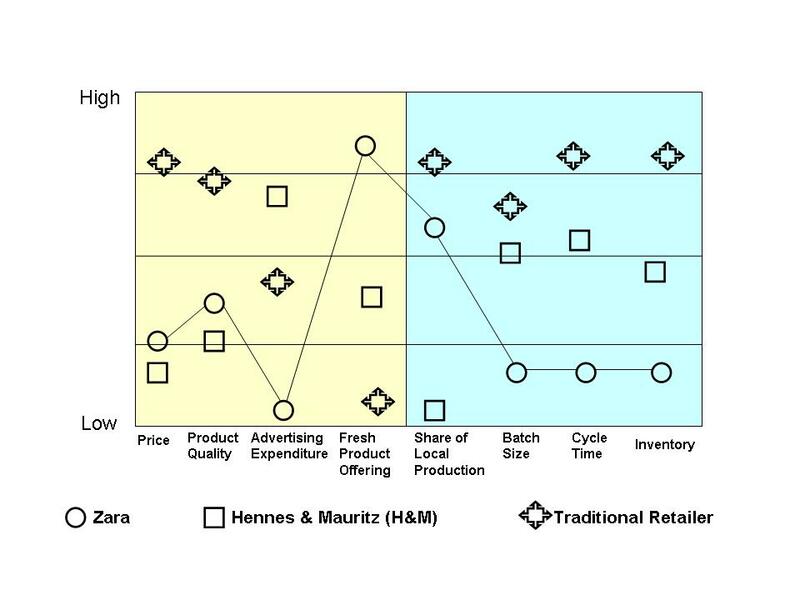 On the left we have listed Zara´s key differentiators vs. competition on the market side, on the right Zara´s key differentiators on the supply chain side. Based on this visualization of a business model we can see: the product offering is only one sub-component of the business model. Accordingly, a product innovation is only a subset of a business model innovation. For simplicity reasons, in the following I will, however, treat product innovations and business model innovations as if they were on the same level. By product innovations I mean innovations that mainly concern the products or services as they are visible to the customer. Business model innovations, instead, combine existing products with the other components of the business model in new ways. In accordance with this definition, product innovations are not a necessary part of a business model innovation. Not to mention patents. This equally applies to Zara as to South West Airlines. Or think of the Aldi discount chain. Also in this business model innovation, product innovation or patents played no real role. This does not mean that a simultaneous business model innovation plus product innovation such as Apple´s iPod does not hold even more success potential. 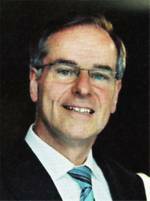 • a new business model, which differs from its existing company master business model. This, for example, Microsoft did with the launch of its Xbox 360 game machine with the Xbox Live online gaming service. • innovative products or services within their existing company master business model, competing with existing business models. Procter & Gamble, for example, tried this with the Dryel textile cleaning kit, which it sold to the consumer via its established retail trade channel. Dryel was meant to enable the consumer to cleanse her delicate fabrics herself at home (new business model). So far, she had brought her delicate fabrics to the dry-cleaners (old business model). The assessment whether a business model is new to the world and therefore a business model innovation can only be made from the perspective of the market and the customers. What they regard as such is what counts. 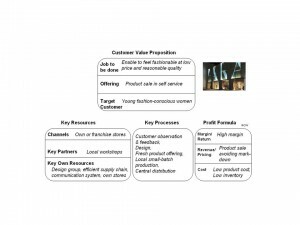 P&G´s master business model, for example, is to sell branded and advertised products, not services indirectly to the private consumer via the retail trade channel based on its five core competencies: consumer understanding, innovation management, brand-building, go-to-market capability, and scale. 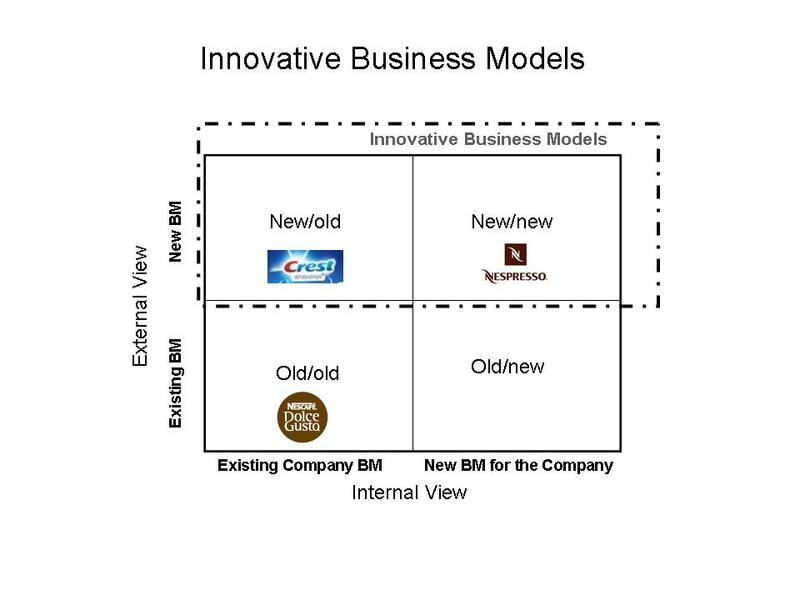 If existing companies such as P&G launch an innovation within their existing company master business models, and if the consumers view the innovation and its business model as an innovative business model because such a business model did not exist before then this counts as a business model innovation. Therefore Crest Whitestrips, P&G´s at-home tooth-whitening innovation, which competes with dentist bleaching (old business model), and which in the end was also sold via the familiar retail trade, is a business model innovation (see the following figure). 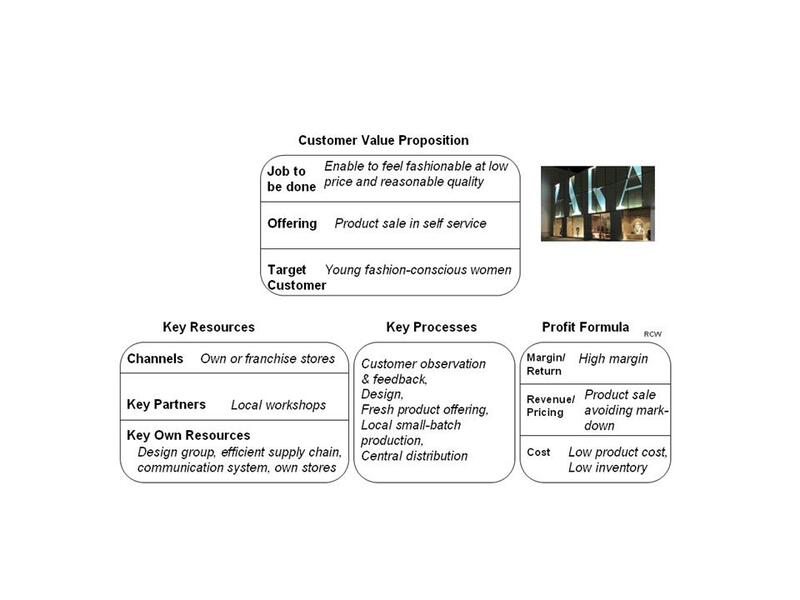 This figure describes business models (BM) both from an external and an internal perspective. Nestle´s Nespresso coffee system is a new business model both for Nestlé and for the outside world, and therefore a business model innovation. Crest Whitestrips, although in the end not being a new business model from an internal perspective as P&G´s master business model is being used, is a business model innovation for the outside world. Nestlé´s Dolce Gusto coffee system is neither new from an internal nor an external perspective as it is belatedly launched in the traditional trade channel after the introduction of similar coffee systems by competition (Sara Lee´s Douwe Egberts, Kraft etc.). enters and scales up a new market which is just forming. Often established companies launch new business models in parallel to their existing business models out of defensive considerations. The management of these parallel business model innovations is not to be underestimated. It is a big challenge. Typically separate business units are assigned responsibility for the management of the new business models. In 1994, United Airlines tried to defend itself against the upcoming Southwest Airlines with the launch of United Shuttle, and Continental with the introduction of Continental Lite. Both defenses were not successful. Because of all the above, in the real business world we can observe many more sequences of product innovations by established firms than sequences of new business model introductions or changes of business models. Often, if a new business model has been introduced, it is followed by a large number of product innovations within this new business model. See, for example Apple. After the introduction of its iTunes software + iPod hardware + iTunes Music Store business model innovation, it launched a long series of iPod innovations followed by the iPhone and the iPad. Another example is Toyota, whose cars were at first very rudimentary and whose business model was very traditional. Toyota’s innovation was the “Lean” business model which started off with the Lean Manufacturing System and to which was then added the Lean Product Development System and a Lean Delivery System. The cars that Toyota brought forth with this system distinguished themselves at this stage by a very good value for money, excellent quality and high customer satisfaction. But they were not yet impressive from a technological nor design standpoint. Toyota achieved design and technological breakthroughs with the launch of the Lexus (1989) and of the radical innovation Prius hybrid (1997), which helped to burnish Toyota´s image as a technological and environmental leader.